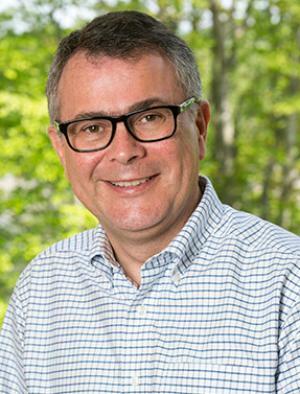 Maurice Hall, Associate Vice President of Water for the Environmental Defense Fund’s Ecosystems Program: Mr. Hall’s work focuses on developing collaborative water management approaches to meet ecosystem needs, alongside the needs of farms and cities. 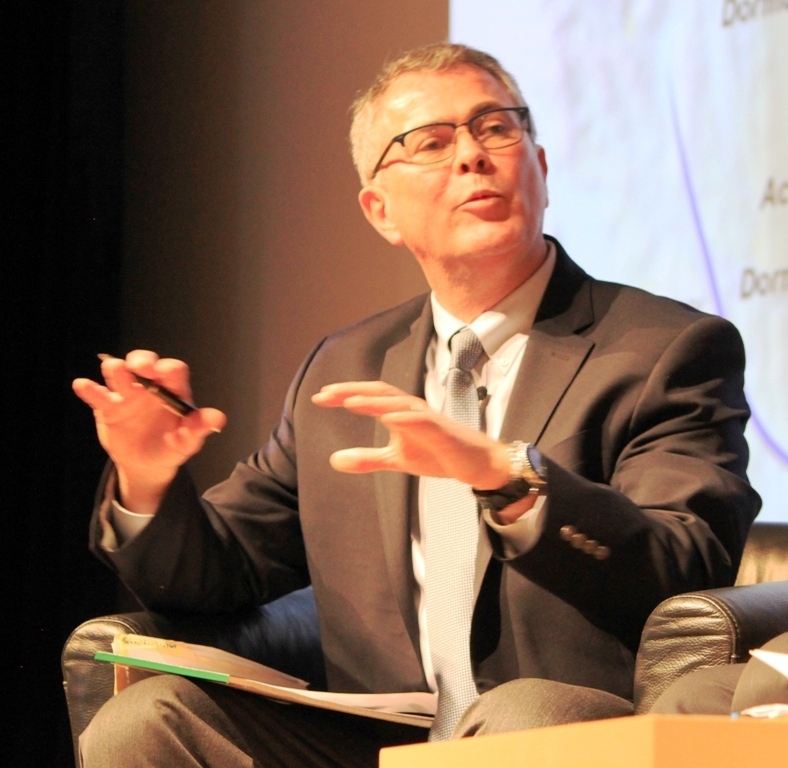 Approaches central to his work include shaping water transaction programs that achieve resilient water supplies while protecting the environment and vulnerable communities, improving information systems to inform smart management of water resources, and shaping water governance that proactively considers multiple objectives while also responding to climate change. 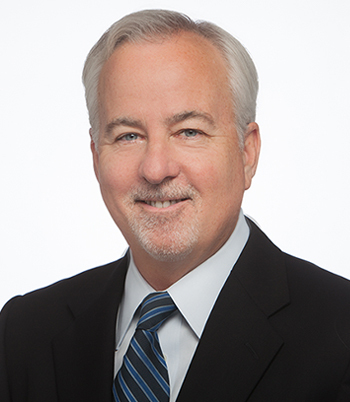 Kevin O’Brien, partner with the Downey Brand law firm in Sacramento: Mr. O’Brien’s practice encompasses a broad range of water issues, including frequent appearances before the State Water Board on water rights matter and litigation in both state and federal courts. He served as trial counsel in two groundwater adjudications, the Santa Maria basin adjudication in Santa Barbara County, and the Seaside Basin adjudication in Monterey County. He currently serves as counsel to the Yolo Subbasin Groundwater Agency, a JPA that is implementing SGMA in Yolo County. 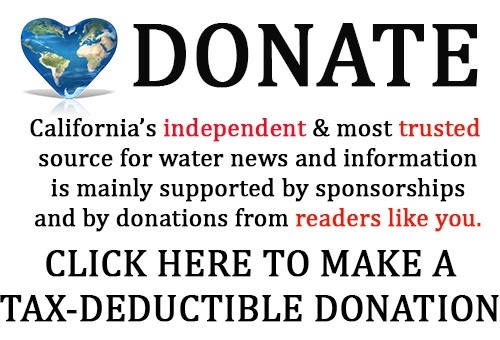 Maurice Hall began by saying that the crux of the problem the state now is facing is how to make the practice of groundwater management match up with the physical realities of groundwater and surface water interaction as well as the legal realities, realities that don’t actually match up very well. 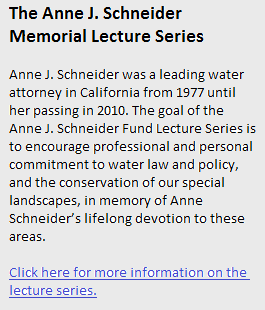 The general premise for this lecture is that two different approaches or perhaps a mixture of the two will become the standard way of approaching groundwater management in California: One dominated by a SGMA-driven cooperative approach and the other a hybrid approach to the adjudication of water rights under the umbrella of SGMA, said Mr. Hall. He noted that while the discussion may tend to be Central Valley focused, the principles they will be speaking about will be applicable in different parts of the state where the geologic setting and perhaps the institutional settings are somewhat different. 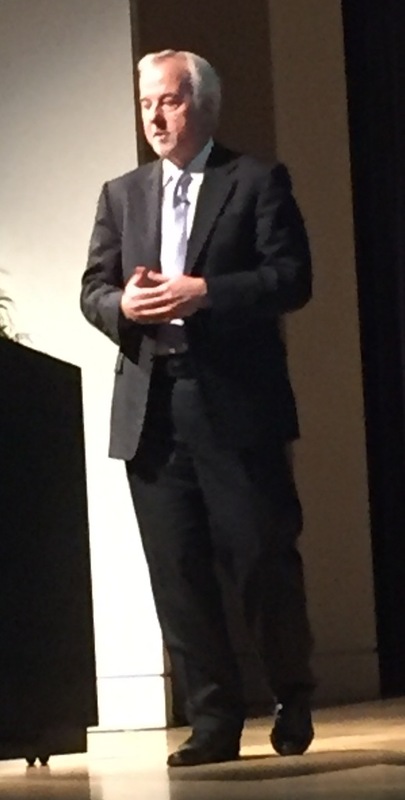 “Physics tend to work wherever you are and the law will find you wherever you are,” he said. Maurice Hall then discussed some general principles of groundwater and surface water interaction. In California, if there is a reasonably flat valley with a stream flowing across it, there is very likely groundwater underneath, he said, explaining that in the natural undisturbed setting, if the groundwater isn’t pumped, the groundwater will tend to fill up the sediments of the valley floor until it finds a low point. Water generally flows downhill, so when the groundwater levels in the aquifer are higher than the river or stream, the water flows into the river and contributes to the streamflow; this is called a gaining stream. 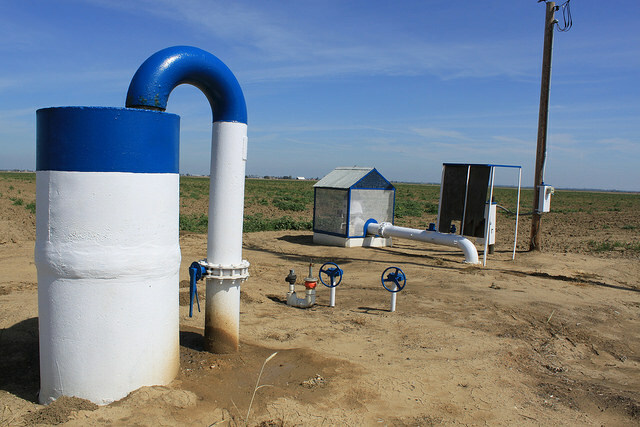 When groundwater is pumped, it lowers the level in the well so that water flows from the surrounding aquifer into the well; this causes the water levels adjacent to the well to drop and eventually that cone of depression will spread. 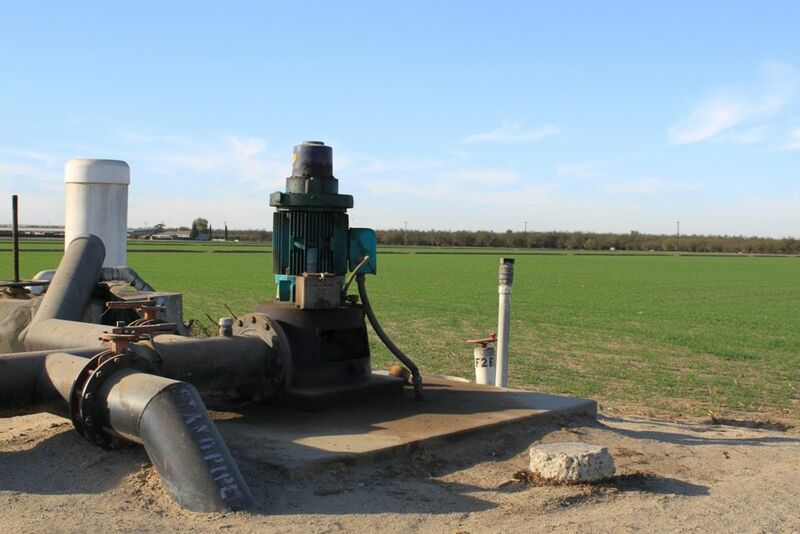 As pumping continues, groundwater levels are lowered over larger areas, which will in turn reduce the amount of water that is flowing from the groundwater into the stream. 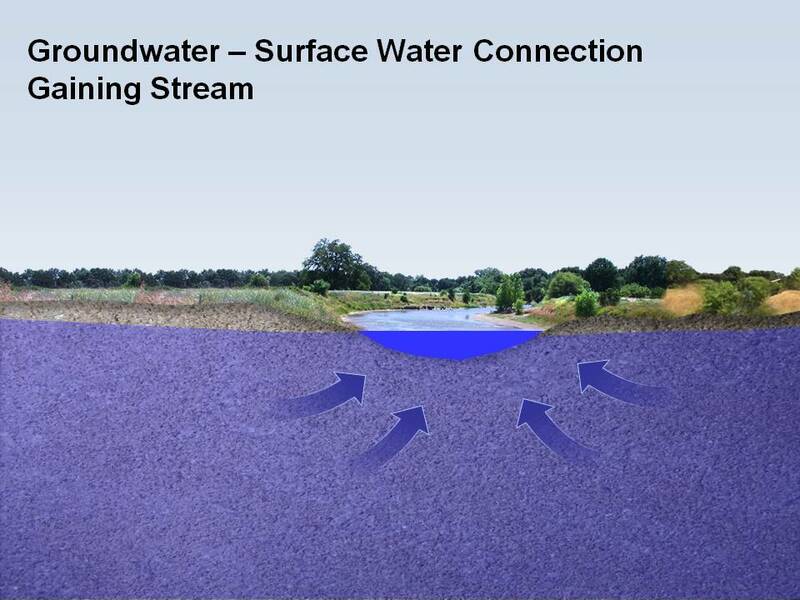 If groundwater is pumped long enough and levels of the groundwater drop low enough, it will reverse the flow, and the stream, being higher than the groundwater, will contribute flow into the groundwater. This is called a losing stream; the stream is contributing or losing water to the groundwater and the groundwater is gaining water from the stream so it’s a source of recharge for the aquifer. In a losing stream, the rate of loss of water from the stream is determined by how steep the gradient is or how low the groundwater levels are in the surrounding aquifer: If the groundwater levels are lower, it’s going to lose water more quickly; if they are higher, it’s going to lose water less quickly. 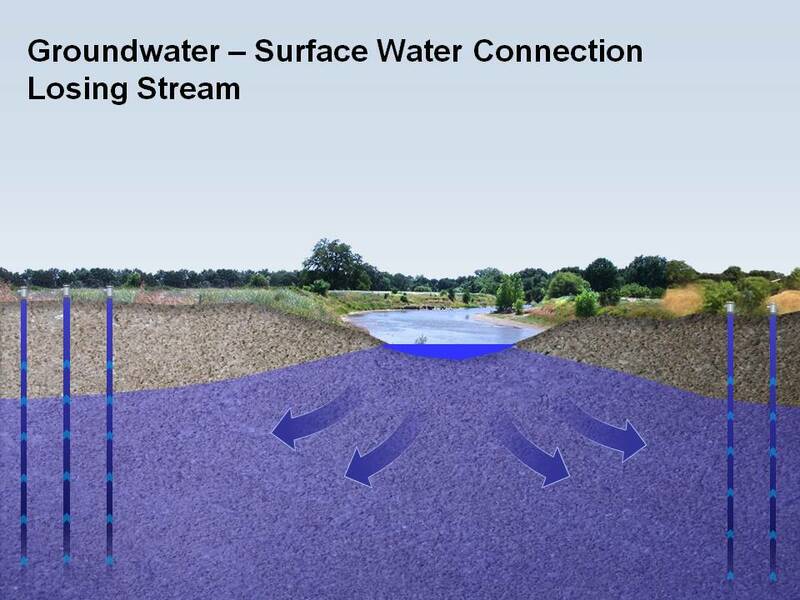 If groundwater pumping continues, the groundwater levels will continue to drop to the point where the stream becomes disconnected from the saturated groundwater. 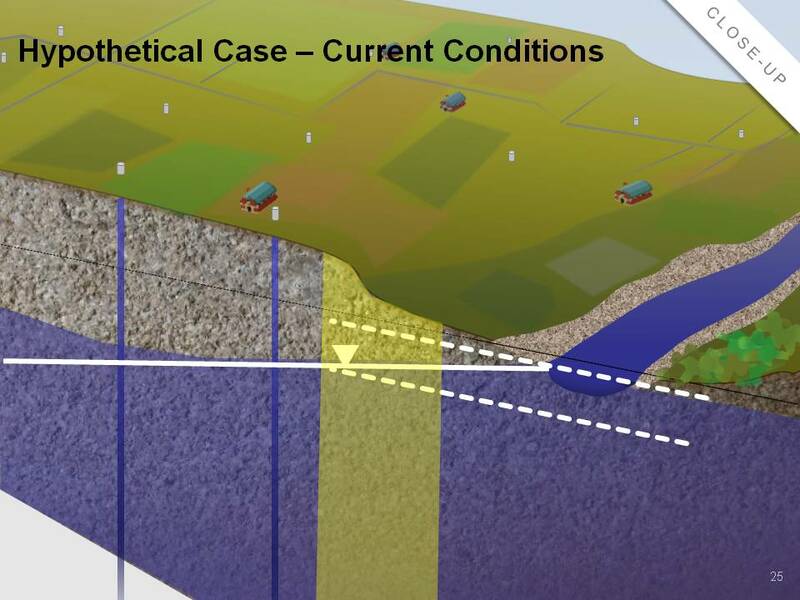 At this point, Mr. Hall said that it really doesn’t matter how much further the groundwater levels are drawn down, the leakage rate or the depletion rate from the stream is independent of the groundwater level; it’s determined by what the characteristics of the sediment are (lower, left). And if the leakage from the stream that exceeds the flow of the stream, all of the water in the stream will sink into the groundwater and the stream will go completely dry (above, right). 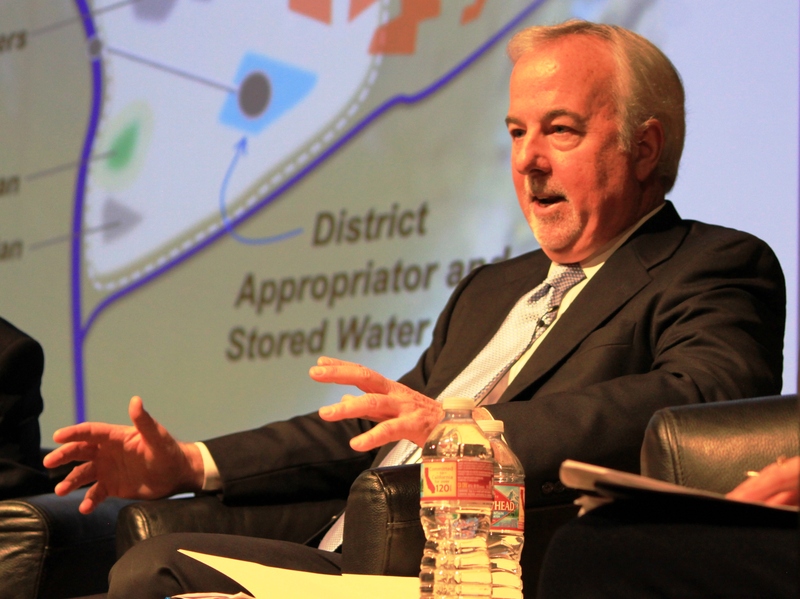 With respect to SGMA and the stream depletion issue, SGMA specifically says that the issue only needs to be addressed where the stream and the groundwater are still interconnected, Mr. Hall said. He also noted that the depletion issue doesn’t just come into play when the groundwater levels are lower than the stream and the stream is losing; they also come into play when the groundwater is gaining and your pumping reduces the amount of gain that the stream is getting. “It’s the same result; it’s just a matter of which the way the water is flowing,” he said. Across the state, there is a spectrum of conditions of streams and groundwater, with some streams gaining, some streams losing, some streams disconnected, some streams dry, and dry streams that before groundwater pumping that might have flowed year round or most of the time but now flow only some of the time, or maybe they are dry all the time. “This is an unavoidable impact of groundwater pumping and not necessarily paying attention or managing for groundwater,” Mr. Hall said. Mr. Hall then presented a map of Sacramento region, noting that Sacramento County basically runs from the Sacramento River on the west to the Sierra foothills on the east, and between that is a valley fill aquifer. 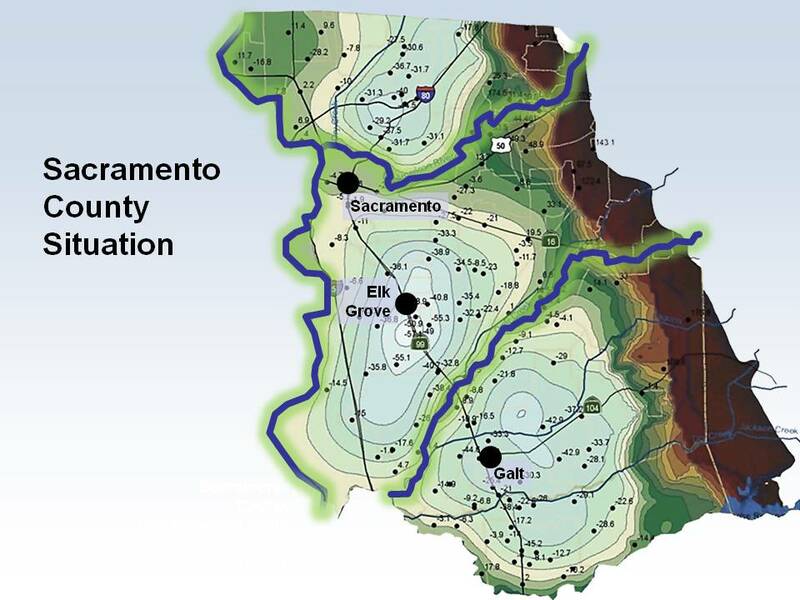 This is a topographic map of groundwater levels made using a groundwater model that is used by many of the water agencies that manage groundwater in the Sacramento region. Lighter colors indicate areas where the groundwater levels are lower; darker colors indicate areas where groundwater levels are higher. There are three regional cones of depression, which are areas where a lot of groundwater pumping has occurred that has drawn the groundwater levels down over time over large areas. The areas that have higher groundwater levels correspond to the rivers flowing through the area: the Sacramento River flowing in from the north, and the American River and the Cosumnes River flowing in from the east. “The American River has a big dam on it, the Folsom Dam, and so the Sacramento River and the American River flow year round out of the mountains and they leak water into the groundwater because we have lowered the groundwater levels in the surrounding areas and that is what makes the groundwater levels higher along the river corridors,” Mr. Hall said. Mr. Hall noted that there are two different situations. The Cosumnes River is a fairly small river; it drains a fairly low elevation area and it’s undammed, so its flows are relatively high in the winter and very low in the summer. The Cosumnes flows year round out of the mouth of the canyon, but as it flows out onto the valley floor, because the groundwater levels are low, it leaks water to the groundwater; in the summer when the flows are very low and when there’s a high enough rate of leakage, the Cosumnes goes completely dry. The situation is similar yet uniquely different for each setting up and down the Central Valley and across California. But just how big of a deal is this surface water depletion? A little bit? A lot? The Nature Conservancy explored this issue a few years prior to the passage of SGMA. Mr. Hall then discussed the issue of how instream flow needs in streams have been addressed up to this point. There is also the time lag issue that stems from the fact that when you pump groundwater, it first lowers groundwater levels in the vicinity of the well and that well depression spreads, eventually impacting the stream or river, but it can take a long time, Mr. Hall said. 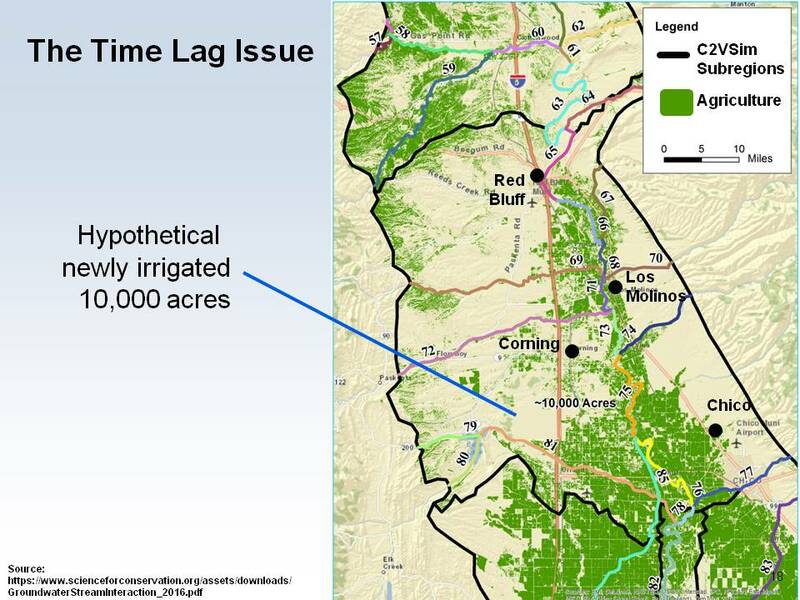 To get an idea of length of time it takes to impact the river, they used the model to simulate what would happen if a new irrigation project using groundwater was started. 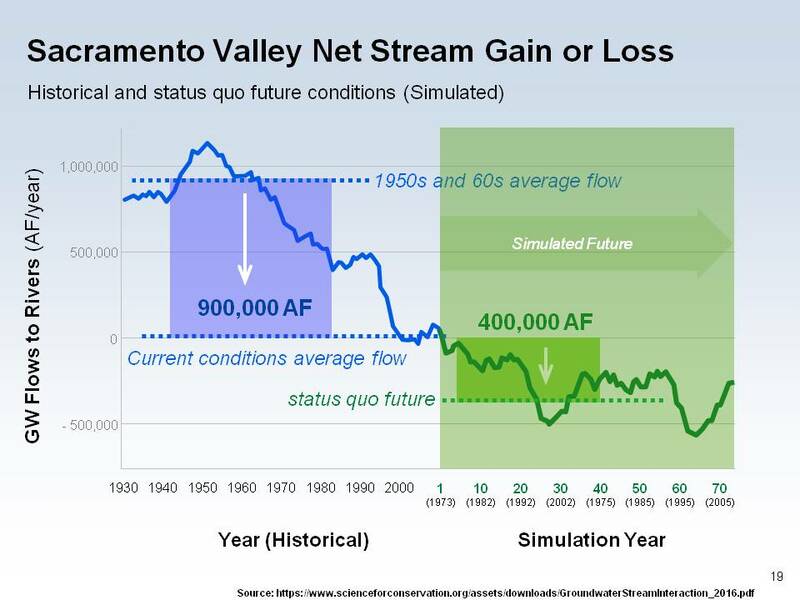 They then ran the model going forward, what is the result of continued groundwater pumping of the hypothetical 10,000 acres and found that per the model, if pumping were to continue at the same level into the future, it would have an eventual effect on reducing the average annual flow in the Sacramento River about 400,000 acre-feet, and that is basically just a delay in impact of the pumping that had already been started. He noted that quite a bit of new agricultural lands have been brought under irrigation in recent years. Kevin O’Brien then addressed the basic legal concepts both relating to water law and SGMA, beginning with California groundwater law pre-SGMA, noting that SGMA does preserve existing groundwater law, so some of the principles water law that predated SGMA are relevant and will remain relevant going forward. 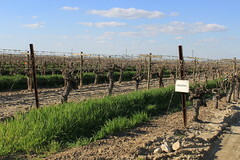 It’s sometimes said that California is the only western state that treats groundwater and surface water under separate and distinct legal regimes, and while Mr. O’Brien acknowledged that is true, a case decided by the California Supreme Court in 1909 suggests that there is precedent in certain factual settings for administering rights to surface water and interconnected groundwater in an integrated fashion. 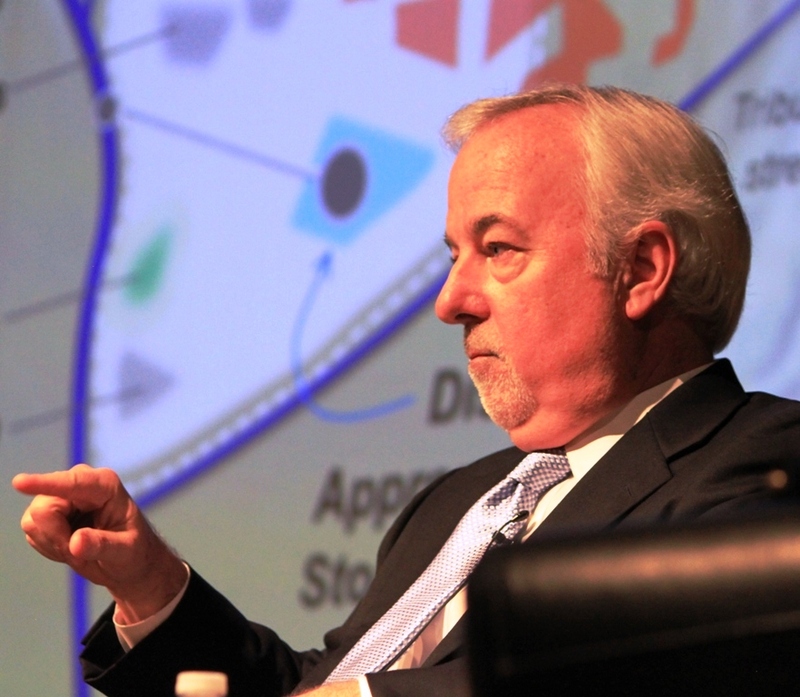 The whole purpose of SGMA is to have Groundwater Sustainability Agencies develop plans so that by certain deadlines, basins are operated so that pumping does not exceed sustainable yield, Mr. O’Brien said. Undesirable results, or the so-called ‘six deadly sins,’ are defined in SGMA as chronic lowering of groundwater levels, reduction in groundwater storage, sea water intrusion, degraded water quality, land subsidence, and surface water depletions that have caused significant and unreasonable adverse impacts on beneficial uses of surface water. 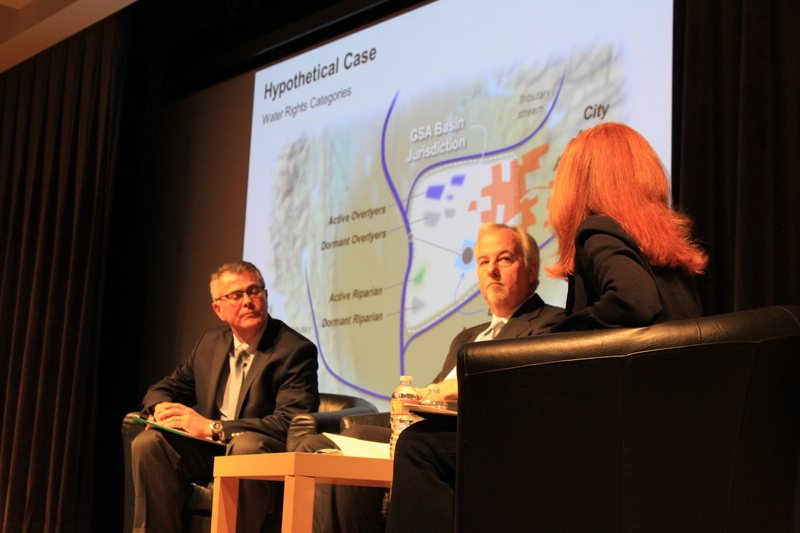 The term ‘significant’ is probably fairly easy, he said, as there are a lot of cases under CEQA on the question of significance and what is significant. 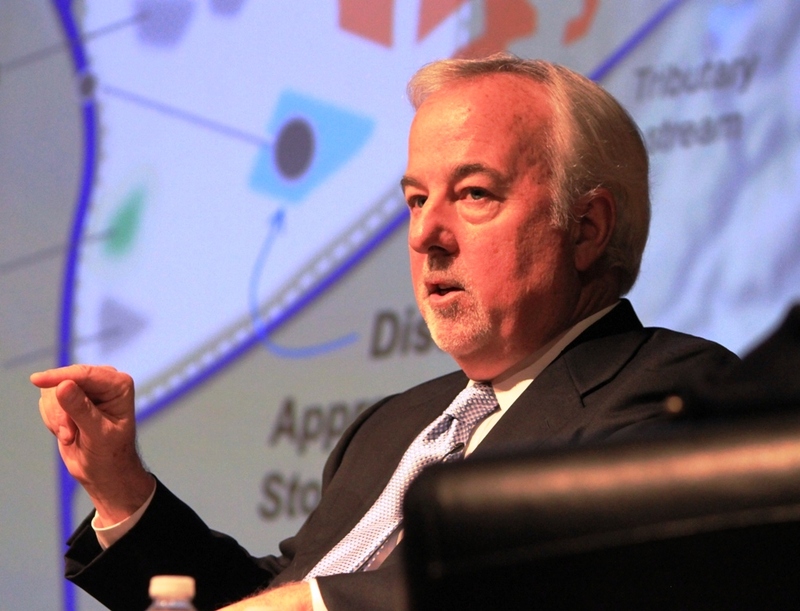 “Over time, what has happened is that agencies have been encouraged to develop thresholds of significance as part of their CEQA analyses, and I think that’s exactly what’s going to happen in the SGMA context, probably as part of the GSP process,” he said. 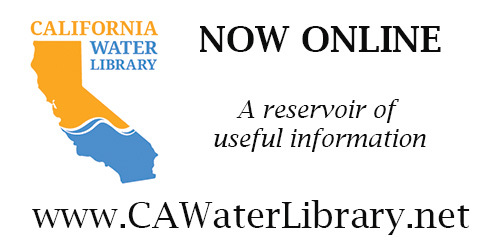 A physical solution is an equitable remedy that courts (or SWRCB or GSAs) have the power to impose; it’s a practical remedy that avoids waste or unreasonable use and is consistent with the water rights of the parties. 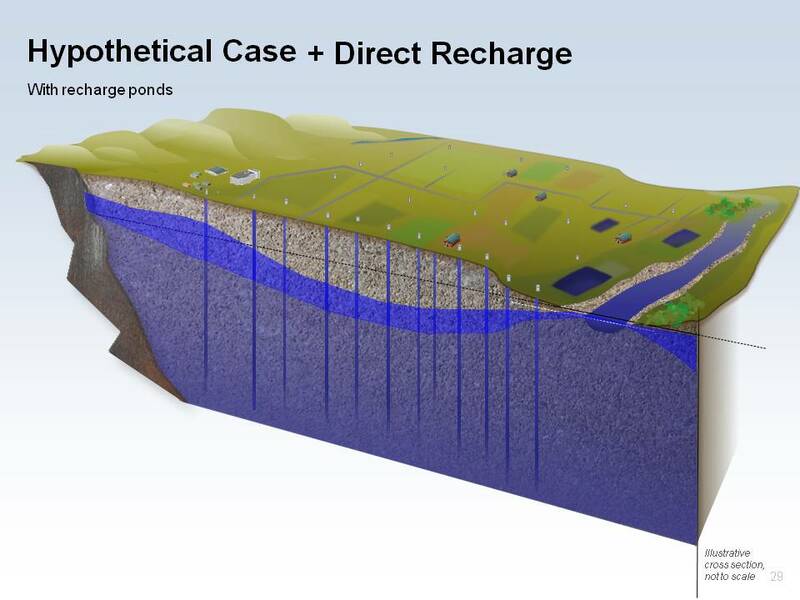 There are various forms of physical solutions, such as a direct recharge project where in wet periods, water is diverted from a stream and put into a percolation pond that supplements the natural groundwater supply, or a conservation program where water can be conserved to the system. 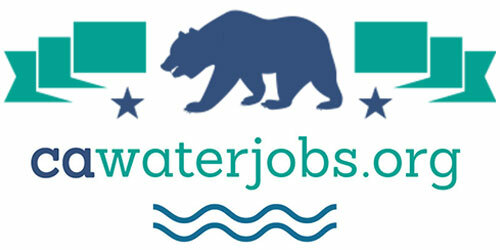 If the State Water Board designates a basin as probationary and the deficiency is not remedied by the GSA, the State Water Board may develop an interim plan, but since the State Water Board has no authority to finance and implement a physical solution, Mr. O’Brien said the emphasis will be on pumping curtailments. 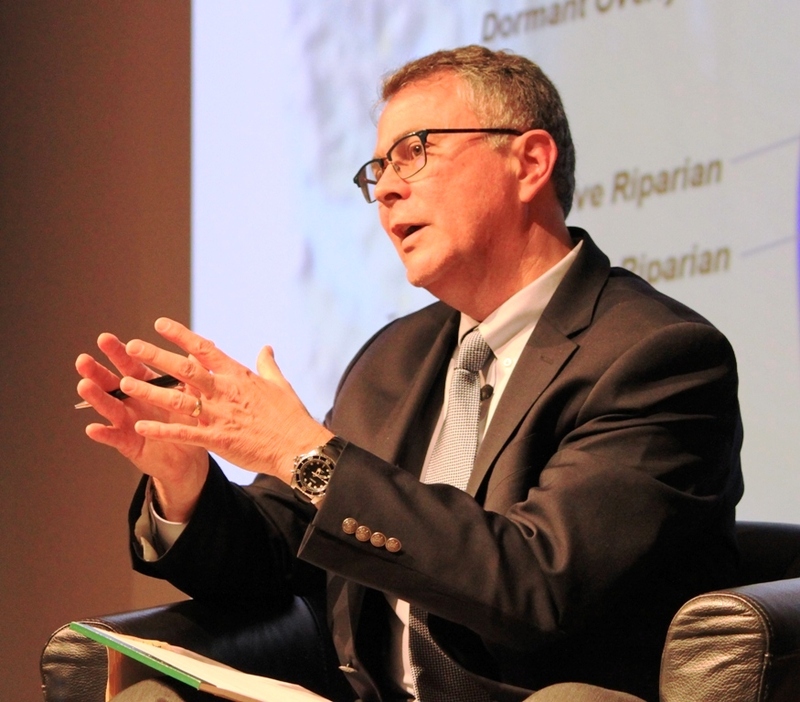 Mr. O’Brien said some (especially municipalities and regulated utilities) say adjudications are expensive, but given the value of water resources in California, they say it’s worth it. He’s not advocating adjudications, but when GSAs start to grapple with the question of pumping curtailments to deal with significant and unreasonable impacts on surface water beneficial uses, the GSAs who often don’t have the water rights expertise might welcome the idea of a Superior Court judge taking a little tiny piece of this process and dealing with it as judges do. After SGMA was passed in 2014 and took effect on January 1, 2015, there was real concern in the Brown Administration and in the legislature that adjudications would be used to end run the SGMA process. So a follow-on bill was passed that streamlined the adjudication process, and more importantly, it made it clear that the SGMA process still was the controlling process, he said. To explore how this might play out on the ground, Mr. Hall and Mr. O’Brien then discussed a hypothetical basin. 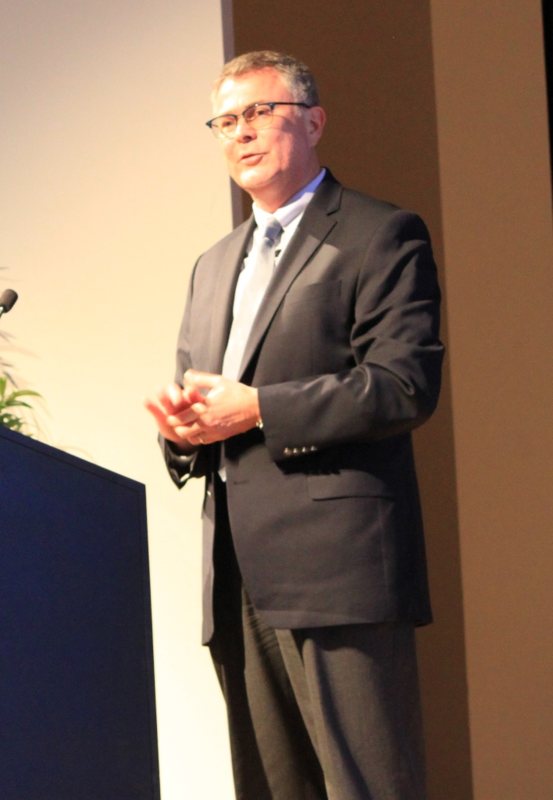 Mr. Hall said that he’s quite optimistic that with patience, SGMA can be successful in integrating groundwater and surface water in most circumstances, and can provide a lot of flexibility that can benefit both the groundwater pumpers who are largely subject to SGMA and the surface water users that they would need to cooperate with. “The central question here is how GSAs are going to address situations where they are pumping can cause or will cause or may cause significant and unreasonable impacts to the beneficial uses of surface water, beyond the levels that occurred prior to the passage of the law prior to 2015,” he said. Mr. Hall then presented a map showing a hypothetical area for a GSA, noting that it’s similar to the Sacramento Valley and there is always variability in the local conditions, but the principles will apply generally in other places. 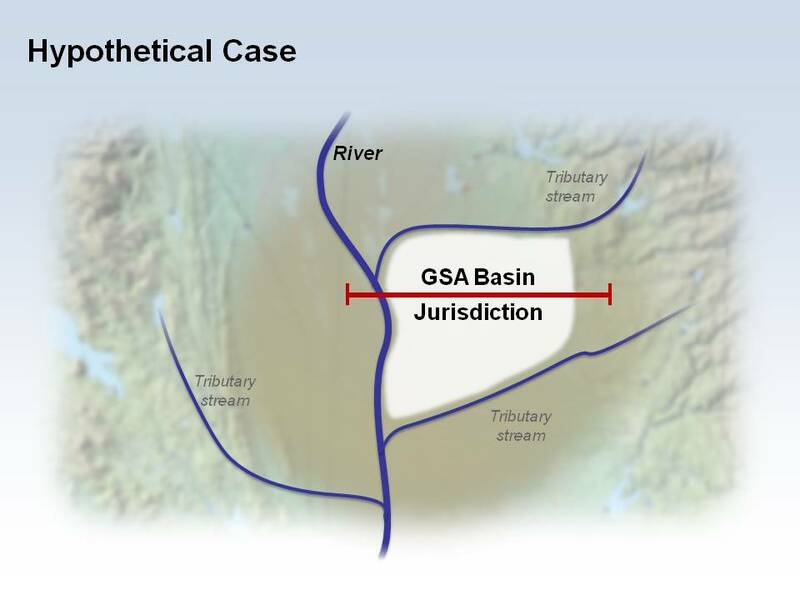 The hypothetical GSA is adjacent to a major river as well as a couple of tributaries that flow into that river, and bounded on the east by the edge of the groundwater basin. 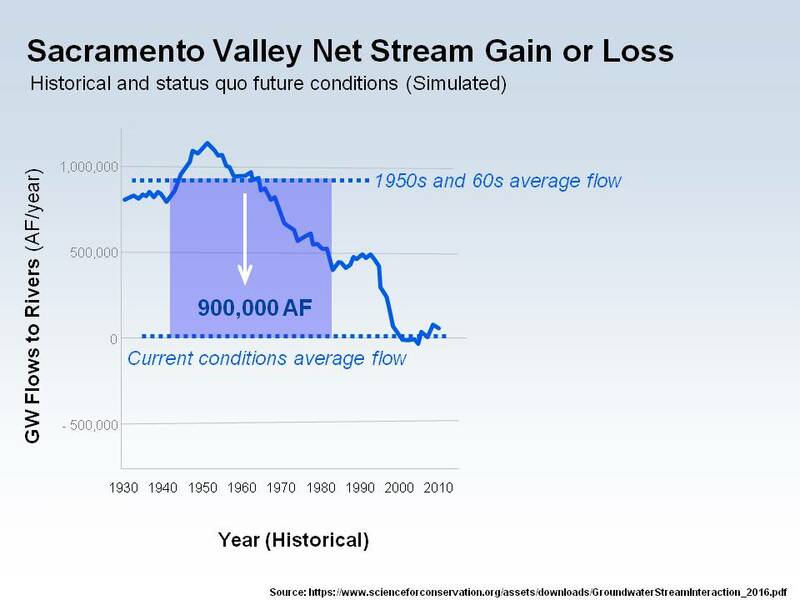 For the purposes of discussion, assume the river downstream is fully allocated at some times of the year most years; he noted that’s the case in many of our streams and rivers in California – not all, but certainly the case for the Sacramento and the San Joaquin. And if the river is fully allocated, the tributaries are also considered fully allocated because all of that water including the tributary flow is required to meet all of the allocated needs downstream at some point. Mr. Hall presented a cross-section of the hypothetical basin, noting that in this basin, they have been pumping for a long time, and the groundwater levels have been drawn down to below the level of the stream, making it a losing stretch of the stream. He pointed out that the same principles would apply if it were a gaining reach of stream, because if the groundwater levels are drawn down further, it’s going to reduce the inflow to the stream, which would still be a depletion of the stream flow. Let’s assume that the GSA has developed a good model, they’ve simulated their system, and their model tells them that if they continue pumping at current levels and they don’t take any further corrective actions, the groundwater levels are going to go down further, he said. The time lag issue is coming into play; they’ve done some pumping in recent decades, and it hasn’t completely shown up in the river. Mr. Hall next presented a slide showing a future condition status quo that would occur with no additional pumping and no corrective measures taken. He explained that while he has drawn the aquifer as looking as if its finely sorted sand for illustrative purposes when in reality, the materials in aquifers is varied and complex, especially near the stream. “There are a lot of complexities and the importance of understanding the local situation is really big, but physics tends to work similarly in all situations,” he said. He acknowledged there are a lot of complications and questions to be answered, such as what were the levels before 2015, how did they go up and down during the year, how did they go up and down through the years and drought years; there is plenty of work for those hydrogeologists and groundwater experts, he said. There are also questions about how far from the river does one set the thresholds; how many places along a stream in a given reach is needed to monitor those threshold levels; and how to account for the fact you don’t really know what the pre-2015 levels were. Another method would be on-farm recharge, or applying water to agricultural lands that have either been fallowed or during a fallow period. 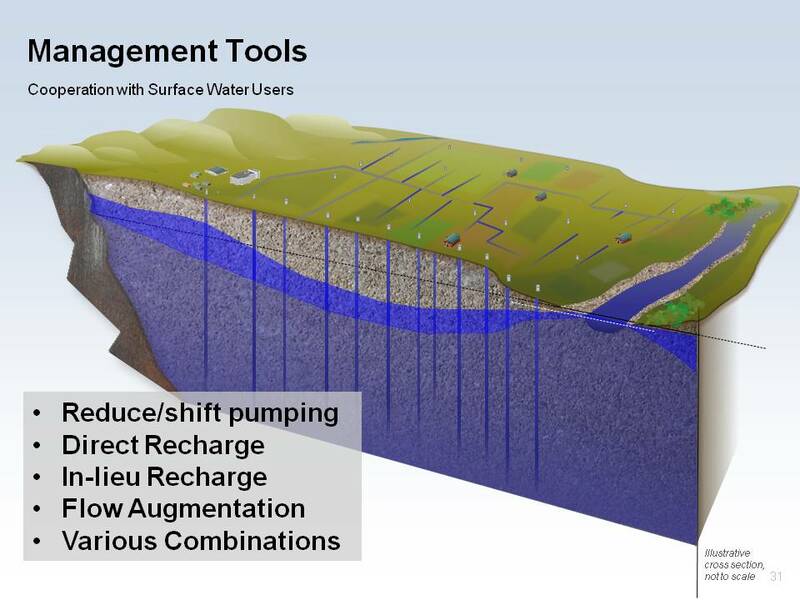 It’s also an important for the Groundwater Sustainability Agencies to acknowledge that direct recharge is occurring in many cases due to the practice of irrigation with surface water. “So Groundwater Sustainability Agencies are going to want to take measures to make sure that continues and perhaps even have more irrigation – maybe think about being a little less efficient during wet periods in order to recharge groundwater during wet periods,” he said. In-lieu recharge means finding someone who has surface water and providing that to groundwater pumpers in lieu of them pumping groundwater either some of the time or all of the time; this has quite a bit of potential as well, he said. Mr. Hall then turned the presentation over to Kevin O’Brien to discuss how he thinks this issue might play out in the hypothetical basin. So how this plays out in each individual situation will depend on the facts on the ground and the local politics, and whether these types of issues go in the direction of a court adjudication, who knows. “But I do think in some situations, some court assistance is going to be required to sort out the very complicated water right issues,” he said. 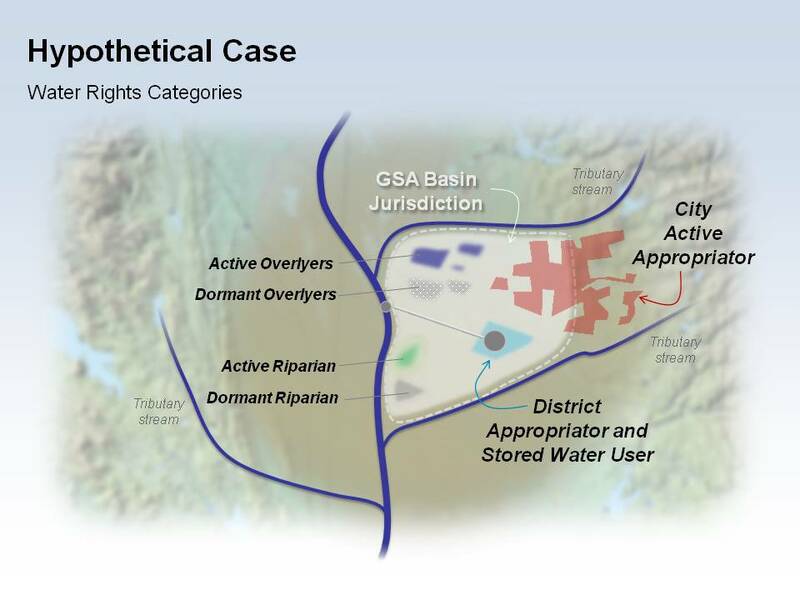 Mr. O’Brien then presented a more complicated scenario for the hypothetical basin, noting that in the basin, there are both riparians and appropriators of surface water, some are active, some are dormant. There is a water district that diverts water that’s been stored upstream in the wet period and released, so it’s a supplemental supply to the natural basin supply. 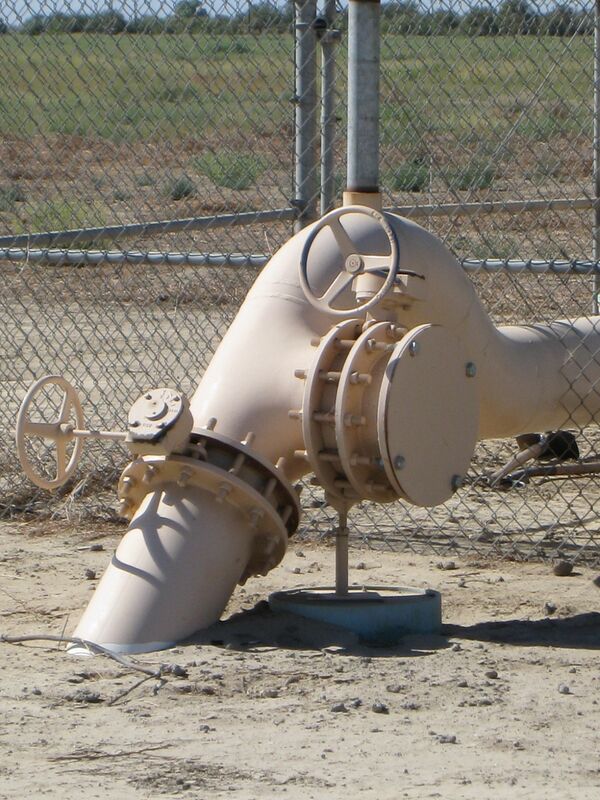 There is a city that is an appropriator with a wellfield that pumps groundwater. He said it’s a pretty simplistic version of what an adjudication is really like because there are different types of water users with different priorities, and the trial judge’s job ultimately is to determine who gets how much and in what priority. Another set of complexities arises from the fact there is both native groundwater in this basin feeding the streams and there is water that has been introduced to that groundwater system through artificial means, such as in a case where a district that has a contract to take water that has been previously stored in a reservoir and use it for irrigation, and some of that water percolates as return flow to the basin. Question: Physical solutions are attractive and provide for greater flexibility, but a lot of them are going to cost money. Someone’s going to have to pay for it. And so how do you see these projects being financed? Then what about Prop 218? Question: “I think about the foresight that went into to Yolo County switching from groundwater to surface water and the impeccable timing that went there, but in your example, Maurice, would you foresee municipal diverters being on the same footing as agricultural diverters? or would there be a special dispensation for municipal diverters that didn’t have the ability that Yolo County did to convert at least a portion of their supply to surface water? “I think one of the realities that’s going to come into play and has many times, is that municipalities, even though in the strict hierarchy of water rights an appropriative right may be a lower priority than an overlying right, municipalities tend to have more money to do things, and so I think certainly there’s going to be some tendency for municipalities to use their capacity to invest to develop collaborative solutions,” said Mr. Hall.